The shirt, quoting Tom Herman's response to Zach Smith's accusations, is being sold online, with part of the proceeds going to a domestic violence shelter. Well, since then, Natalia Vaughns (the mother of Longhorns’ linebacker Byron Vaughns) turned that response into a message displayed on t-shirts and hoodies. Vaughns then put those up for sale on her online store (with part of the proceeds donated to Texas domestic violence shelter Women Called Moses), and sent one to Herman’s wife Michelle. 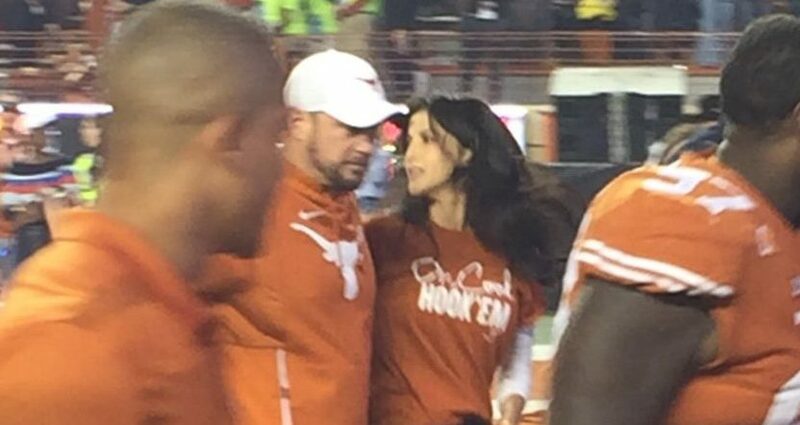 And Michelle Herman not only tweeted about that Saturday, she wore that shirt to Texas’ 24-17 win over the Iowa State Cyclones Saturday. It’s fascinating to see Vaughns turn Smith’s attack on Herman and Herman’s understated response into motivational clothing, even more so with part of the proceeds going to a charity helping survivors of domestic violence. And it’s really remarkable to see Michelle Herman then don that on game day.